Do you dream of soaking in a deep tub without any assistance and with little effort? Do you wish you could lay back and relax as the hydrotherapeutic water jets massage away your aches and pains, as the soothing aromatherapy scents fill the air and healing color fills your bathroom? It no longer has to be a dream. 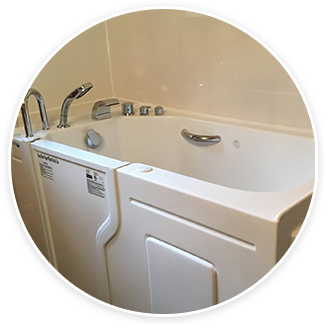 You can now have a luxurious spa experience in the comfort of your own Barrie home, even if you have been unable to bathe unaided in years, thanks to safety tubs from Safe Bathing Canada. Low threshold entry. Conventional tubs can be as high as 18", making it difficult for people with limited mobility to raise their legs and lift them over the rims. As such, they often require the assistance of a caregiver. However, a walk in tub has a threshold of approximately 4", making it much easier for people to independently navigate. In-line heaters. People with limited mobility can sometimes take a bit longer to do the things that others take for granted. That's why safety tubs feature an inline heater to help maintain a comfortable and safe water temperature. Power speed drain. A soft push on the pneumatic drain button will quickly and completely drain the tub in fewer a matter of seconds, making it quick and easy for you to exit the safety tub. Now you can stop worry about bathroom accidents and instead start relaxing in your sanctuary. You no longer have to rely on other people, or face anxiety. Bathing will no longer be a major chore. A safety tub will give you peace of mind and independence in the comfort of your Barrie home. Contact Safe Bathing Canada today to discuss how you can own a safety tub from as little as $5 a day.